We live in a digital age. That is not news to you unless you've been living in a cave in some remote area completely off the grid. Nearly every day I'm told of the "must have" apps for my smartphone. I think the number is up around 4,329. I jest, but barely. Observation: We are bombarded by digital possibilities, many of which are in fairly constant motion, evolving and morphing. Many of us feel like Nemo trying to hold on in the EAC. . ."Grab shell, dude!" Observation: This is nothing new. I mean, I think the speed of change is faster. That reminds me of the famously funny Lucille Ball bit with the chocolates. We have to make choices faster of what to keep and what to discard, or at least ignore until the next iteration. Now online education has been around since the mid-1990s. Really. It has. And alternative education has been around for a lot longer. Back in the early days of online platforms, there were a lot of limitations because, well, we didn't know what we could do with the technology and we really didn't know what we wanted or needed to do with the technology. So when we look at the platforms today and when we look at MOOCs, we see how far online and blended learning has evolved. Lost in the debate and hype over MOOCs and other innovative ideas to finance and deliver a college degree, however, is that we are living in an important evolutionary moment, not a revolutionary moment, for the future of higher education. When any sector of the economy undergoes sweeping change—just as colleges and universities are now—every new development feels like a major turning point. But in hindsight, what we think of as big moments at the time often turn out to be just blips in the life cycle of an industry. Change, by its nature, is incremental. Big advances in a given year are few and far between. We have become an impatient lot, expecting significant change to occur with unfaltering rapidity. Not gonna happen. Selingo goes on to say "To transform higher education for the next generation, we need to better blend game-changing innovations with one another, and with traditional methods." This is true of K-12 as well. Transformation requires a blending of innovations and tradition, but NEVER change just for the sake of change. MOOCs are new. Digital technologies are newish. While it's technically true that smartphones have been around since the early 1990s, the technology and the idea of smartphones didn't gain currency until nearly a decade later. I'm not saying we have to wait ten years for the educational revolution to evolve, but I think it's fair to say that we have to be more patient with the changes just as we have to be more intentional and purposeful of the changes we choose to adopt, those we choose to discard, and those we choose to set aside until we can figure out if they're valid and/or what to do with them. At the same time, I also think it's fair to say that the educational revolution itself is not new. I think education has been evolving for some time now. Perhaps we got off on some weird detour and perhaps we're still crawling through a morass of legislation and less productive thinking, but we also have to learn from those mistakes. The oft-misquoted George Santayana said, "Progress, far from consisting in change, depends on retentiveness. When change is absolute there remains no being to improve and no direction is set for possible improvement: and when experience is not retained, as among savages, infancy is perpetual. Those who cannot remember the past are condemned to repeat it." There are hundreds of quotes on progress. 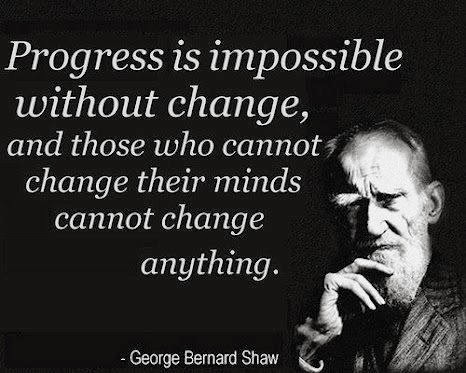 One of my favorites is a George Bernard Shaw quote: "Progress is impossible without change, and those who cannot change their minds cannot change anything." Change is a process, and often a slow one. Progress is often gained by inches, not miles. We cannot throw up our hands and call something a failure if some fabulously amazing outcome doesn't occur right away, or within a year or two. And, as I'm inclined to clichés today, we must learn to expect the unexpected. Folks who have worked in technology know this and our innovative world is littered, if not cluttered, with stories of enriching but unexpected discoveries. Returning to Mr. Selingo: "This much, though, is certain: Many more front-page proclamations about the future of higher education may be proved wrong in the coming year, but without these early experiments, we can't ever evolve to what comes next." The same can be said for K-12, so let's keep moving forward. What comes next could be really exciting.